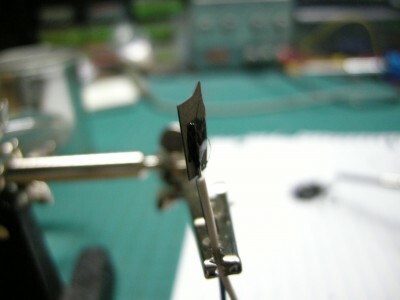 Well, I was trying to solder some extra thick peizo material, having very little luck when I realized that this could be solved very easily with some sort of conductive adhesive. So I set out to make some. I’m posting the steps for making a conductive adhesive for posterity and in case anyone needs to know. It’s not difficult though I have tried a few different methods and this one is the best. 1. Find your glue, preferably one that requires drying or curing, not anaerobic adhesives like Loctite (cyanoacrylate). I tried a couple of versions of Loctite and found that the conductive medium would merely clump together, making an oatmeal-glue. You can use adhesives like Rubber cement, 2 part epoxy or even white glue (polyvinyl acetate). In this case I used two-part epoxy. It has a long cure time and its fairly rigid. Nothing much to see there, since I wanted to use only a few drops of actual adhesive, I only mixed a gram or so of the stuff. 2. Prepare the medium. 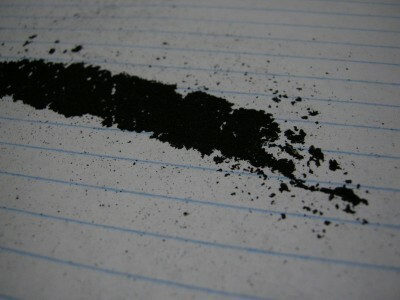 In this case I used a conductive graphite powder and iron filings. 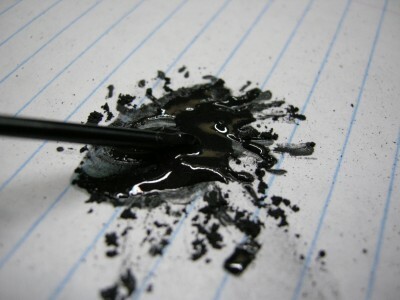 If you’re going to use iron filings, magnetize them first by letting them rub on a magnet, then force them off and into the graphite mixture. 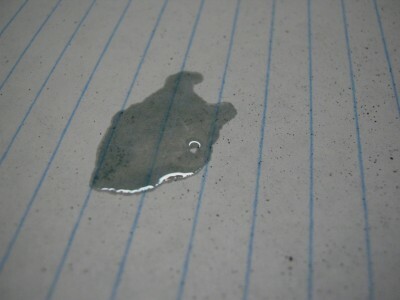 Beware that using a water based glue can make the iron filings oxidize. Anyways, if you don’t have any graphite on hand you can crush up some pencil leads in a crucible or on something that will allow you to make the graphite as fine as possible. And in the event of not having any iron filings, like me, do what I did, grind or file down a piece of steel or an iron nail. make sure they’re magnetic. Now, you may ask “Why iron, and why magnetize it?” Well, the iron provides low resistance paths through the adhesive and when you apply a magnetic field to the iron filings, they align themselves to the field, thus you can create a lower resistance path. I’ve reduced the resistance with this method by tens of KOhms based on the little I’ve done this so far, your results may vary. 3. Mix the glue and medium. Well this is a pretty simple step. The only thing you’ll many though is to add enough of the medium to make the overall adhesive almost clumpy, mixed to the point of saturation. This way you can ensure conductance. 4. Application of the glue. Simply apply the glue however you want, wherever you want. You’ll get less resistance if you place the two conductors as close to each other as possible though. Also, you’ll want to place one or two magnets, polarity aligned to the connections zones, near the adhesive. This will make the iron (if you used it) move slowly into lengthwise position between the two conductors. This is the peice of peizo material attached with epoxy.